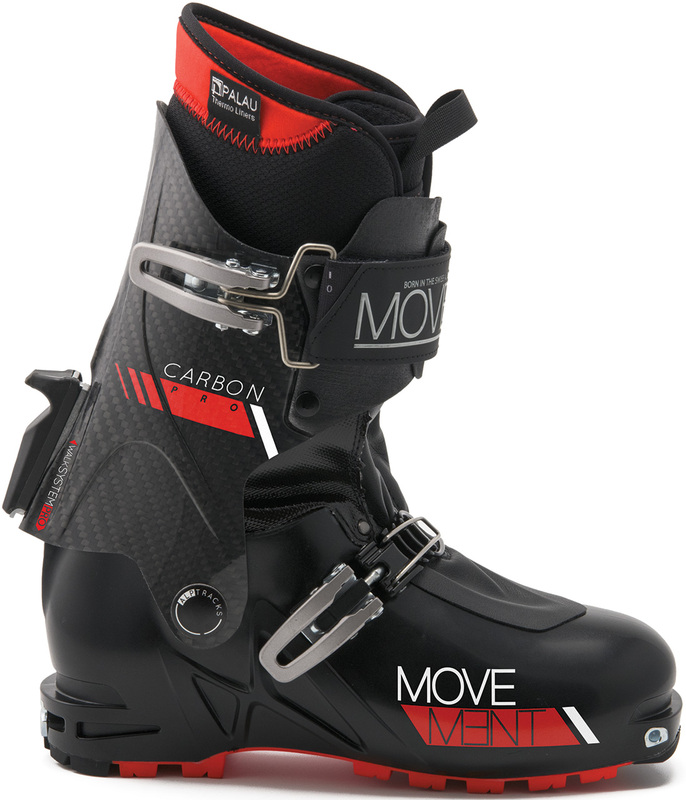 With its speed-focused design, the Movement Carbon Pro Boot will certainly get you to places quickly. The boots are equally honed for ski-mountaineering racers and tourers who think time is precious. A specially-designed, full-carbon cuff gives a PRO flex to absorb high-forces without causing compression during hectic race-descents and mixed conditions in the backcountry. 75° of ankle articulation give the uphill that feeling of gliding up the mountain rather than hoofing. The Movement SKYWALK soles keep you glued to the booter when every step is critical. You will find that the Palau Light Pro Liners and integrated boot gaiter keep the feet warm and dry leaving you only to focus on the goal; beat the competition. Integrated power-strap / cuff buckle offers a quick and precise cuff-hold. Palau Thermofit Light Pro Liner keeps your feet warm and can be molded for an exact fit. Attached waterproof gaiter prevents snow and debris from getting in. Instep Buckle with ergonomic micro-adjustment make it easy to dial in the fit. Hike mode has 75° articulation to give you the most efficient touring experience. 100% Carbon Cuff and Grilamid Shell offer a great skiing experience. Dynafit certified inserts are consistent and safe. These seem like a beefier boot then the Alien RS. How do they campare? I really want to get into a pair of F1s’ and these seem like a lighter pair of those. Am I way off with that thought? Hi Maass, the Alien RS is stiffer than this boot in forward flex. It's more akin to a race boot than an F1. In my quest for skinny ankled boots I came by and tried on the Free Tours yesterday, and found the heel pocket to be wonderful (slight overstatement). I'm wondering if this boot will fit similarly to the free tour? Hi Chris, it's definitely similar in that it's made from the same molds. Note the liner is thinner and the shell is sized down, two things which sorta cancel each other out. Have any of you had a pair on your feet yet? Movement claims a 130 flex index on their site?! Flex ratings are always super subjective but that is quite the claim for a <1000g boot. Hi Paul, yes I've had them on. They are definitely not a 130 flex. While more supportive than some other race boots, they aren't super stiff. Maybe 100? You're right, it's subjective. What is the last size on this boot? Hey Andre. Should be 100mm!